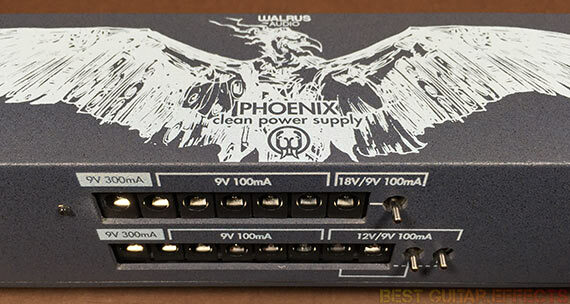 After releasing the avian themed Aetos Clean Power Supply, a great unit for small to medium sized pedalboards, Walrus Audio have spread their wings and released the massive Phoenix Clean Power Supply. This could be the power supply to end them all as it dwarfs the competition with 15 outputs and a range of powering options for a diverse array of modern guitar pedals. Our Walrus Audio Phoenix review will determine if this is truly the best guitar pedal power supply on the market today. Includes 15 standard power cables, 2 “Line 6” cables, and power cord. 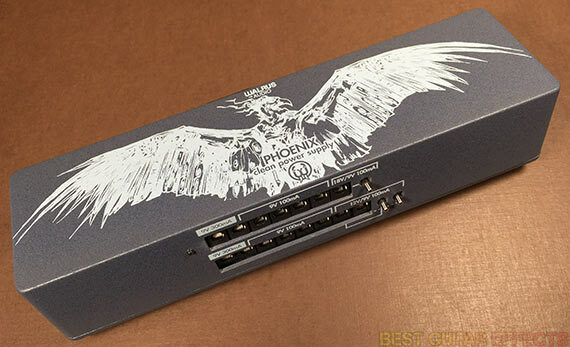 Visit Walrus Audio for more info about the Phoenix Clean Power Supply. A reliable pedal power supply is arguably one of the most important unsung heroes of your pedalboard. I’ve experienced firsthand how terrible it can be to have a power supply fail (10 minutes before a gig no less!). Since then I’ve been taking my time when it comes to new power supplies to see how well they can endure before I consider my impressions conclusive. It’s one thing to talk about a bunch of specs, but only by putting the unit in action over an extended period of time can you discover just how well a power supply performs. I’ve been using the Phoenix for nearly 6 months now, so it’s about time to share the good word on how it lives up. 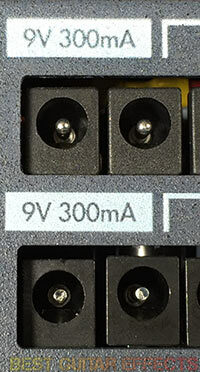 Let’s jump right in and talk about the four 9V, 300mA outlets. The big step up from the Walrus Audio Aetos is that the Phoenix has more of a focus on being used on larger pedalboards, particularly, boards with several high-end digital pedals with massive power requirements. If you own any of the “big” Strymon or Eventide pedals, you might have noticed that they come with power adapters that are in the 400-500mA range. Fortunately, these pedals’ current draw is actually significantly less, allowing the Phoenix to power them with ease from any of its 300mA outputs. I used the Phoenix with the Eventide H9 Harmonizer, Strymon TimeLine, Strymon BigSky, and Strymon Mobius without any issues. I was also able to power the Free The Tone ARC-53M effects router from one of these outputs as well as various >300mA draw pedals like the Electro Harmonix HOG2, Strymon DIG, and Strymon Deco. You can also plug your Walrus Audio Descent into one of these outlets if that’s your reverb pedal of choice. 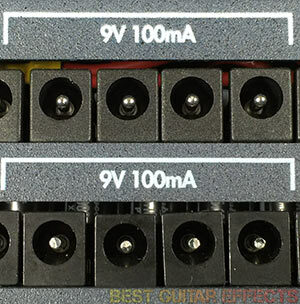 The eight 9V, 100mA outputs provide plenty of power for most standard sized stompboxes. Your various overdrives, distortions, and fuzz pedals (Walrus Audio Janus, anyone?) will mostly be powered from here. And you’ll have enough juice for most modulation and delay pedals including the Walrus Audio Bellwether. And the Phoenix still has a few surprises left in store. There are a few flip-switches located near the last 3 of the outputs. Two of the outputs let you kick up the voltage to 12V for those select few pedals that require it. Also, the one last output lets you select between 9V or 18V. While most pedals require only 9 volts, some pedals will benefit from higher voltage often with increased volume or enhanced tonal qualities. Check your manuals to see if your pedals are 18V compatible. For example, the Chase Bliss Audio Gravitas gets a noticeable boost in headroom at 18V. Also, the trio of Xotic SP Compressor, Xotic SL Drive, and Xotic EP Booster mini pedals are all worth trying at 18V as well. As far as cabling goes, the Phoenix comes with 15 cables of longer than usual length to accommodate a significantly larger pedal area. If you’re mounting the Phoenix on the top of your pedalboard (and it’s certainly tempting considering how attractive its artwork is), you’ll be able to use the longer cables to reach the pedals on the out perimeter of your board. If you’re mounting the Phoenix beneath your pedalboard, those longer cables will still help with routing power to where it needs to go. 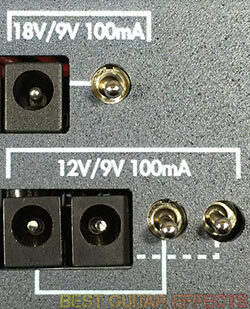 The courtesy outlet is an always indispensable feature that any pro-grade pedal power supply should have. The Aetos power supply had one, and the Phoenix sports one, too. For the crazy pedalboard I rigged up for Burning Man this year, I actually powered the Aetos from the Phoenix by using the big bird’s courtesy outlet. I then able to use the Aetos’ courtesy outlet to power a “wall-wart” adapter for the Doepfer Dark Link MIDI-to-CV converter. Basically, a courtesy outlet ensures that any pedal with an incompatible power requirement (AC-powered Whammy? ), wireless system, or other device can be powered from the Phoenix (or Aetos!). Gripes are minor but worth mentioning. The outlet jacks are quite close together, a necessary design element to accommodate the massive toroidal transformers on each end of the Phoenix while keeping it as small as possible. But this does make for a tight fit if you’re trying to make use of all 15 power outputs. Some guitarists might wish for straight barrel jacks on one end to compensate for this. Also, the 15 standard power cables all have the same 2.1mm barrel jack, but a few of my ends were significantly tighter than normal. Trying to plug them into the power outputs or my pedals’ inputs resulted in applying more strain than I felt comfortable with. I wouldn’t recommend trying to force these cables into the jacks as this could damage your pedal or the Phoenix. I’m hoping this was just an isolated incident. Also, when you plug the power cables into the Phoenix’s outputs, you may notice a slight movement from the PCB that the output jacks are mounted on. Assuming you don’t frequently arrange your pedalboard (or try to plug in those tighter-than-normal plugs), you should be fine. But I would like to see some additional reinforcement to prevent the jacks from moving when plugging in the power cables to ease any concerns about long-term durability. This minor tweak would most likely earn the Phoenix a perfect score. But let’s hope that’s not a cause for much concern as the unit I’ve been testing has been going strong for months on end, and I plan to rely on the Phoenix until further notice. The Walrus Audio Phoenix Clean Power Supply is one of the top contenders for the ultimate pedal power supply available. If you have a large pedalboard, the Phoenix has the wingspan to cover it. If you have several high-end Strymon & Eventide pedals, the will power up to 4 of these power hungry stompboxes. If you need power for up to 15 pedals (and maybe more from the courtesy outlet), the Phoenix will rule your pedalboard roost. Along with the Aetos, Walrus Audio has proved yet again how to make a great pedal power supply for modern guitarists. That concludes our Walrus Audio Phoenix review. Thanks for reading. Want to buy the Walrus Audio Phoenix?